Back in the fall, The Girl decided she just had to have some show bunnies. Sheesh…why the heck not?! We’ve always jumped into every farm adventure with both feet…whether we knew anything about said adventure before hand or not. Could bunnies really be so hard? Besides, The Girl said she’d take care of them all by herself, and promised that she would have no problem letting them go at the end of the show season. And who can really say no to bunnies?? And they were soft, and fluffy, and oh so stinkin’ sweet. The Girl handled them twice a day, every day as promised. She even made a bunny log so she could track what they were eating and gaining, her idea and all by herself, with hand drawn pictures of each of the four bunnies :)…and they never once tried scratching her wrists off. Show day came about two months after we got them. 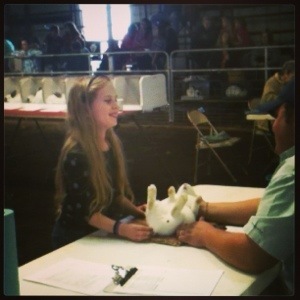 They took a respectable 37th place out of about 90-ish entries…and they made the sale! Yep, bunnies all of a sudden became the easiest FFA project ever…and did I mention we only went thru one bag of feed?!? Easy AND cheap…I think I’m in love! But…now what? Show was over and The Girl was devastated that she had to sell them. 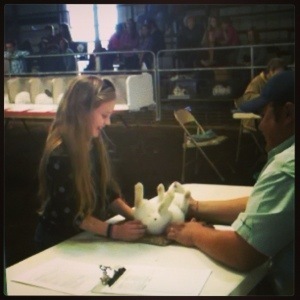 So we did what we do best, we procrastinated, and we hemmed and hawed about it till one night while I was milking and The Girl was loving on one of her bunnies when she started giggling about how fat he was. I glanced over and saw that the little guy looked like he was growing a little…UDDER?! Do bunnies even have “udders”?? You see, we were told all 4 bunnies were boys, which gave us all the time in the world to grow them out to wabbit stew size figure out what we would be doing with them. 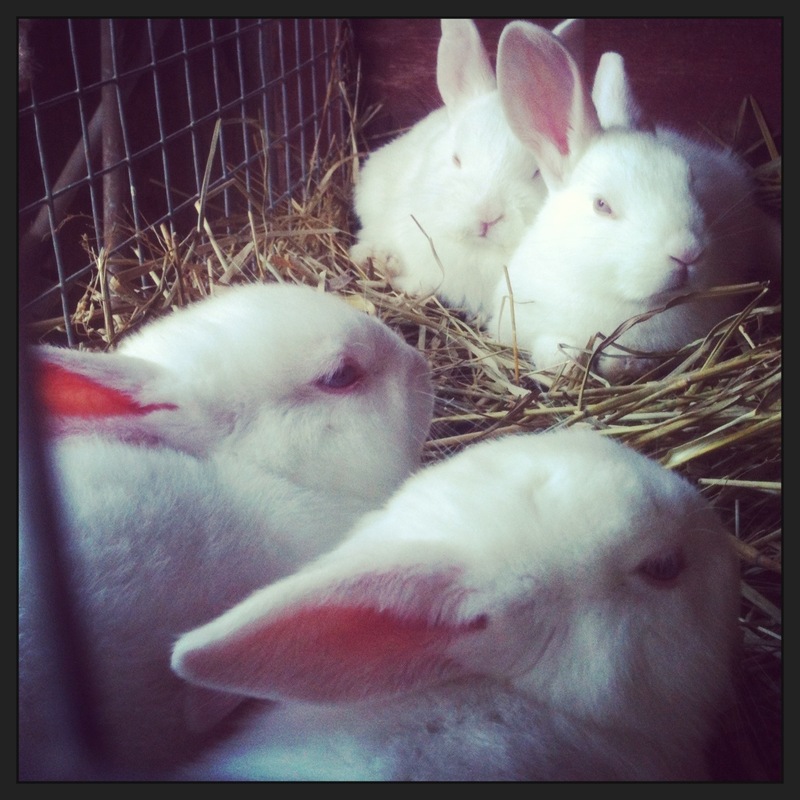 Next day there was fur all over the cage, a definite sign of impending baby bunnies. We put the little fatso in a different cage and a couple days later she delivered. Unfortunately the one little bunny she had didn’t make it…and neither did the OTHER girl’s kits. Yep, that makes TWO girls out of the four, sheesh. However, even with the disappointment from the loss of the bitty bunnies, a bunny business plan had begun to form in The Girl’s head. Poor thing, it’s a curse…we just can’t have or do anything “just because”…I blame my momma, and my grandma, and heck might as well throw my great-grandma in there too since I’m pretty sure it started with her ;). 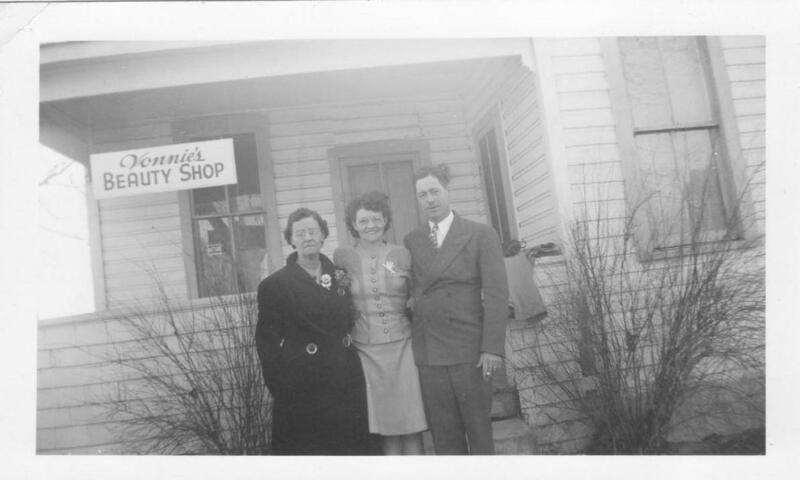 Grandma Perkins’ first beauty shop. Since we already had the cages, she reasoned, couldn’t she please just keep them and sell the babies or, <gulp>, raise them for meat?? It seemed like a grand idea, till our cool spring turned into a downright hot summer and the wascaly wabbits started to get miserable…and then started getting out. After a week or two of rounding them up every night and after seeing how they looked so content running around the barnyard and paddock we decided they could just stay out for a while. Besides, they couldn’t fit thru the smaller openings at the bottom of the fence, so they should be safe and sound, right? The Girl was warned that we may lose one, or all, this way but when a week passed and the bunnies were all still accounted for we started to think free range bunnies might not be so bad! 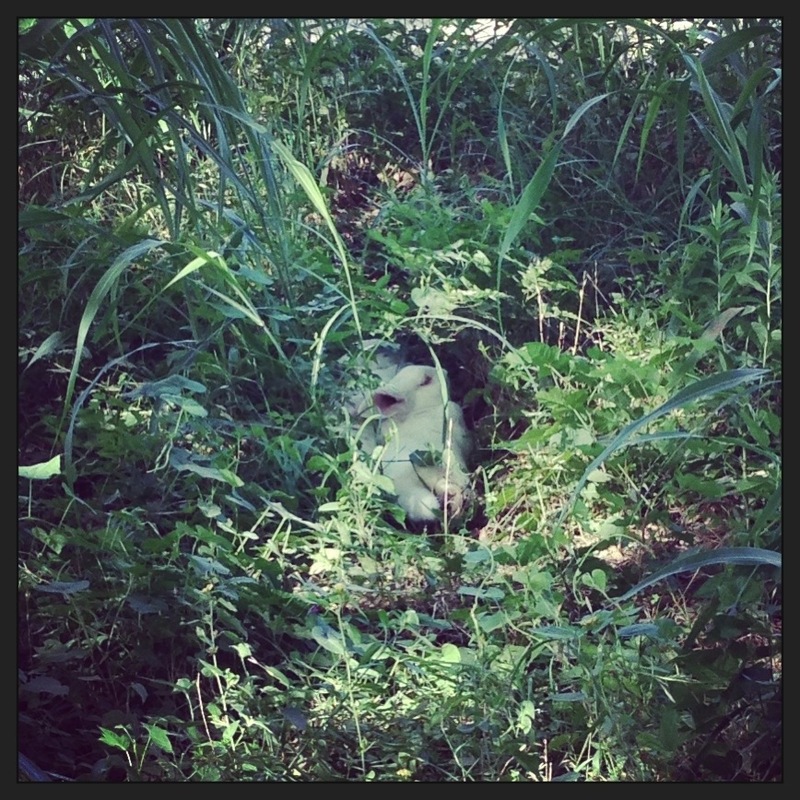 Then one day we only counted three bunnies. Then a couple days later another disappeared, then a third. The Girl was a wreck. Just when we thought all hope was lost, one showed back up, granted he was missing a small piece of ear and had a slightly wild look in his eye, but he was back nonetheless! 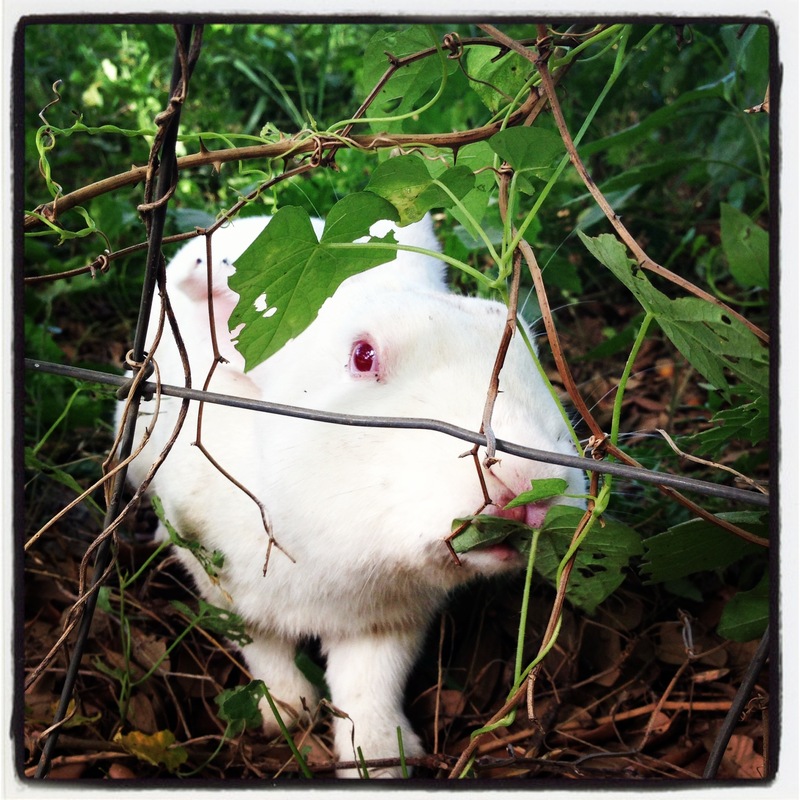 We kept him out and spied on him hoping he would eventually lead us to the other missing bunnies. To our surprise he cooperated and finally led us right to them! And it’s no wonder we couldn’t find them…they were outside the fence…next to the road!! Since we figured they’d been there for a few days already, we decided they’d be ok to stay there…the fact that they were totally surrounded by, and most definitely covered in poison ivy may have had a little something to do with that decision. However, the next day when the neighbors hound started hooting and hollering from the general direction of where the bunnies had been we knew that their free range time had come to an end. It took four of us over an hour to chase those darn things back to the barn, and I’m sure the neighbors driving home from work were wondering what the heck we were up to THIS time, but I’m happy to report that all four bunnies are accounted for and barricaded into their pens…how they were opening the door in the first place is still a mystery. 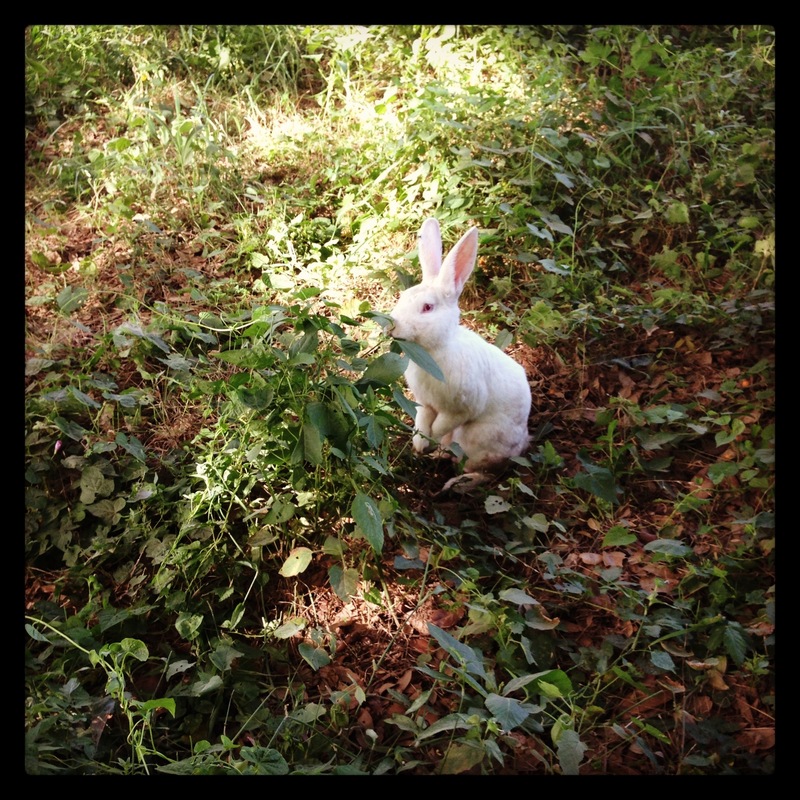 Our first attempt at free range rabbits has failed, and I’m pretty sure they picked up some fleas while they were out in the “wild”…seriously, how do you get rid of fleas on a rabbit? Knowing how happy they were out there means I’m sure we will try to figure something else out, but for now I’ve got poison ivy and scratched wrists to tend to ;). Before I could get this posted, The Girl went out and checked her bunnies and we found this!! This harebrained…heehee, couldn’t help myself…bunny plan just might work out after all! I admit it, we are horrible at naming animals. It’s been that way for years, ever since a stray dog wandered into our yard. We kept thinking he’d be claimed or head back home, but he wasn’t and didn’t, so we called him Dog…original right? Next opportunity to come up with an oh so unique name was when we bought the jungle that would eventually become Sweet Liberty Farm. Apparently our “vacant” property was actually home to a sweet little dog who we named Lady. We’ve had a donkey named Jack, a black and white Hampshire show pig named Oreo, and Broke-Leg, the hen with a limp from a healed broken leg. I know, it’s a problem…thankfully we have some pretty original kids. 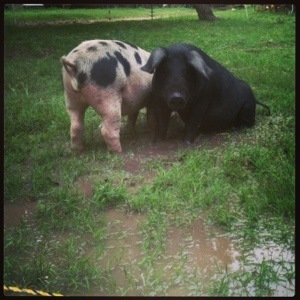 Their first foray into naming was with our very first pigs. They came up with Maple & Crispy, otherwise known as Mrs. & Mr. Bacon. 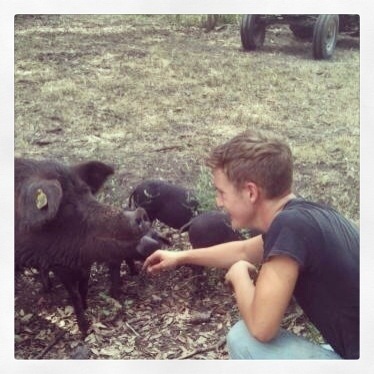 Our first heritage piglets were a Red Wattle gilt who we were going to raise up to be a momma, and her brother who was destined for the freezer. Boy 1, tired of hearing us call them “piggy”, decided they should be Lucy and Stanley. Such originally silly names for pigs, right? Oh, but how their names suited them, especially Stanley’s. As a final tribute to our boy Stanley, and to avoid boring name choices in the future, it was decided that all of our future meat piglets would be named Stanley…ahem, even if we were raising more than one at a time…I told you we were bad at names. Meet Black Stanley and White Stanley…otherwise known as “The Stanleys”. They are out of our two litters this last winter and will be heading off to “freezer camp” sometime this fall. Black Stanley is kind of grumpy, but you’ve never seen bliss till you’ve seen him being sprayed with the water hose. And, oh my, White Stanley is such a happy, sweet, easy going boy who has his momma’s quirky personality…I am dreading that final goodbye…but not nearly as much as I despise the idea of promoting the practice of factory farming by buying those dry, tasteless supermarket packages. If you would like to raise a Stanley of your own, but don’t have a way to…why not let us do it for you? 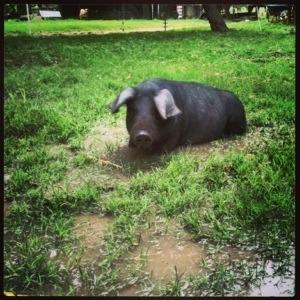 We currently have limited openings in our Half and Whole hog CSA Shares. 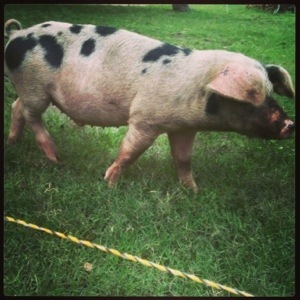 Please see the Pastured Pork page on our farm website www.SweetLibertyFarm.com, for more info.